Can’t wait to get outside. I was half-way watching the national news the other day when the anchorman mentioned cats and really got my attention. A study conducted by scientists from the Smithsonian Conservation Biology Institute and the Fish and Wildlife Service estimated that domestic cats in the United States, our indoor/outdoor precious pets and outdoor strays and ferals, kill around 2.4 billion birds and 12.3 billion mammals a year, making cats one of the single greatest human-linked threats to wildlife in the nation. This was very sobering because even though Tigger tried to bring a bird’s carcass in the house once, I’d assumed it was already dead. 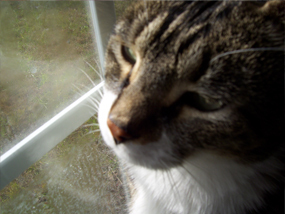 My precious Tigger would never kill a bird in cold blood he had no intention of eating. In hindsight Tigger rather blatantly flaunted several kills, leaving uneaten corpses right in front of the door. Of course that study snatched me right out of the state of denial I’d been living and drove home the harsh reality that those many times Tigger bit and scratched me, he could’ve inflicted much more damage. That the spoiled, cantankerous Tigger is a killing machine has added a whole new dimension to our relationship. Maybe he sensed the gig was up. That there was no longer a need to sheath his instinct because he and I had a near physical fight a couple of days later. So I can personally attest to at least one cat’s ferociousness. He was peeved because I refused to give him more of his favorite snack. Lower sodium honey roasted turkey. I’d quit giving it to him at one point, but started back after Zoey died, figuring why the hell not. Now he’s like a crack head always wanting to hit the pipe and I’m the dealer. I attempted to bribe him with firm strokes down his back and a good scratch beneath his chin. He seemed to be chilling which made me relax because that baritone meow of his puts me in suspended animation to the point all I can think is how do I get him to stop. I took my eyes off of him for just a second to check the time and he hauled off and bit me on the hand. I rapped him on the forehead. His ears went back, his eyes got manic, the fangs came out and he struck at me with a paw. I jumped up and damned if he didn’t look ready to pounce. Picture a cat pinned to my chest and me trying to pry him off. My heart was pounding like a runaway stallion and adrenalin was prompting my feet to lash out. Good thing we came to our senses and backed down. Now some of you may find this strange. But knowing my cat could be a vicious killer actually makes me feel better. Knowing that cats with no home wandering the wild won’t starve because they are natural born hunters definitely takes a load off. Maybe my love for cats is blinding. I see the birds and mammals as collateral damage. It’s survival of the fittest and if my Tigger ended up outside having to fend for himself, I sure as hell want him to be the fittest. Thanks to that report, the scratches on my wrists and arms and the corpses I’ve seen with my own eyes, I now know that Tigger can take care of himself if he had to. I know the last thing environmentalists want to see are more cats roaming all over the place, especially feral ones. In a perfect world all cats would have homes and be kept perpetually indoors. But we all know this world is far from perfect. Speaking of which, Tigger was outside the other night when a dog barking its head off made me open the door. There he was tail all bushed out. I didn’t see a dog but had to keep hissing at him to get him to stand down and come in. It took a while for his tail to morph back to normal size. Sensing I was proud of him he strutted around showing off. Domesticating cats thank goodness hasn’t neutralized their natural instinct. Hunting is what cats do and I for one like knowing my cat wouldn’t starve if God forbid, he ended up in the wild. Greetings and thanks to all who took time to drop by my little blog last year, all 8,000+ of you, lol. I started the blog in March or April or something like that which averaged about 1,000 views a month give or take. Trusty WordPress gurus crunched the numbers and came out with this:600 people reached the top of Mt. Everest in 2012. This blog got about 8,700 views in 2012. If every person who reached the top of Mt. Everest viewed this blog, it would have taken 15 years to get that many views. Again, thanks everybody. Now that I’ve stuck a foot in to test the water, I’m going to dive on in. When I was a college student many moons ago, I dated a guy from Nigeria, actually we lived together for a couple of years, but that’s another story. I was raised in small towns in Eastern NC. If you ever traveled 64 East back in the day, chances are you passed through one of those ‘if you blink you’ll miss it’ places of my youth. Other than work and more work, there wasn’t a whole lot for a sharecropper’s daughter to do. Of course I watched the two or three channels the tv picked up. But when I picked up my first lit book somewhere between the age of 4 and 5, I was in love. I traveled to exotic places and saw so many things through the eyes of the characters in the stories I read. By the time I started college, this small town girl felt like a sophisticated world traveler. So naturally when I met my Nigerian prince that accent had me at ‘hello’. We met in a laundromat of all places. Right then and there I told him the good parts of my life story. I told him about my grand pop so naturally that meant we had to move in together. Watching him with his friends, listening to them speak in their native tongue or ‘broken’ or whatever it was when they didn’t know each other’s language, was a real treat initially. Overtime it got annoying. I found it rather rude especially when they did it in my presence. It wasn’t like they didn’t speak English. The most interesting thing though was when they ate that big ol’ ball of dough. At least that’s what I called the fufu they communally dipped into a usually slimy stew or soup made with okra, tomato sauce, dried fish, chicken, and all else. Sometime during get-togethers they invited me to partake of the cuisine, but no way could I bring myself to eat what was essentially bisquick and water turned into dough. Not to mention I didn’t find several people dipping into the same sauce appealing if you know what I mean. To their credit, I never saw anyone double-dip the fufu, but no one wiped between fingertips either. To meet them halfway, I sometime took a serving of soup or stew in a small bowl, which very often was quite delicious. The two years we co-habitated he did most of the cooking. My idea of a meal was grabbing a burger, making a sandwich, or occasionally eating the Colonel’s fried chicken, biscuits and cole slaw. Although I tried to make his African cuisine it never came out right. But there was this one dish I promised myself I would make someday. I’d tried it at another one of their many gatherings. It was made with black-eyed peas without the eyes. They called it moi-moi or moin-moin. Recently, a local television station featured the dish one weekend and put the recipe on their site. I missed all but the tail end of the show but went in search of the recipe. It looked darker than what I remembered. Nor did I recall a boiled egg being in there. But memory can and do get foggy over the span of years so who knows. With a hard copy of the recipe safely within the confines of my cluttered handbag, I took to the big box store. The small bag of black-eyed peas had been soaking for nearly six hours or so when it occurred to me the eyes and hull had to come off the things. The recipe said they would rub off. The two I picked up out of what looked like zillions of soaking beans didn’t rub off too easily. Now I’m remembering why it’s taken all these years for me to attempt the recipe. A Nigerian, a beautiful nutmeg-hued sister, told me that night how she’d rubbed the eyes out and pureed those peas to the consistency of squash baby food. I remember staring at two large turkey size tinfoil pans of moi-moi. That was a lot of black-eyed peas. Why it would’ve been the equivalent of cleaning ten buckets of chitterlings. It must’ve taken her hours and who had hours to devote to one dish, no matter how delicious it was. Soak the beans overnight. Rinse and rub between your hands to remove skins. Grind the beans to a smooth paste with very little water. Grind onions and peppers and add to beans. Add oil and seasonings and mix well. Slowly add warm water and stir until the mixture coats the back of a spoon. Oil a loaf pan or spray it with Pam. If using eggs, cut a slice off the bottom so they’ll rest flat, and place in the bottom of pan. Sprinkle with salt and freshly ground black pepper. Gently pour the bean batter over. Cover the pan with oiled foil. Place in a bain marie (set into a roasting pan slightly larger than the loaf pan and add water to come halfway up the sides of the loaf pan). Bake for approx. 40-60 min at 350F, or until set and pulling slightly away from the edge of the pan. Remove from the oven and bain marie. Allow to cool for 10-15 min. Gently run a knife around the edges of the pudding. Unmold onto a platter and garnish with vegetables of your choice. I used green beans and more roasted red pepper. Moi-moi can be made with seafood and/or meat as well or just plain veggie. Moi-moi can also be cooked in the traditional banana leaf instead of the foil pan if available. A bit more difficult but more tasty and worth the effort. I am a cat lover and every now again run across a jewel of a tale about cats. Recently I stumbled across a story in The Huffington Post that reaffirmed what I’ve felt all along. Cats are mystical beings bequeathed by the universe and once you’re aligned with the right cat or cats truly magical things are brought to bear. 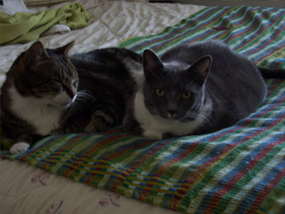 This I know firsthand because as I lay dying last year my cats were with me. There I was on my bed and they jumped up to join me. After rubbing them a bit, Tigger, the big tabby sniffed at me and ran off. Zoey, my fat fluffy grrrl who loved me to her last breath, ran off too. It was the salve I’d stupidly put on my shoulder blade, thinking it would rid me of the monstrous abscess. The golf ball size thing had released toxins into my blood stream that was killing me. It had been killing me for several days. Still I talked to Tigger and Zoey in my best Doc Holiday voice from the movie Tombstone. “Get on then you mangy cats,” I heard myself say. “Nothing but fair weather friends the both of ya,” I muttered and giggled or at least I think so. Had I not known better, I would’ve sworn the rum cake I’d consumed earlier had made me tipsy. Of course all of it was a dream. My room door was shut that morning. The cats as they normally do were probably meowing and scratching to get in. My son, who’d found me clinging to life, had knocked on that closed door. I woke up from a four-day coma and was in the hospital two weeks. If I’d not carried on with the cats in my dream, I’m convinced I would not be here today. Anyone who loves cats and has had a near death experience may find the story especially endearing. It touched my heart and in case you’ve not read it, I’ve included it here for your entertainment pleasure.